Hollywood Soot, the Fire in La Grange. "The north wind—unusually strong this March—carried the voices from those gathered below to me, and I could hear their whispers and gasps. And it wasn’t the ablaze Botts Title Company that trumped the conversation, or the equally ablaze China Inn Restaurant, Bertie’s Barbershop, or the income tax lawyer’s office. No, it was the Cozy Theater, slotted between Bertie’s on the left and the JC Penney catalog store on the right." 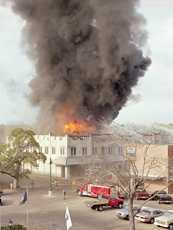 The following text is based on the author's experience of the fire on the La Grange, Texas town square, Mar. 8, 2000 (Ash Wednesday). The dry heat wafted across Washington Street and forced my eyes open—WIDE—so as to take everything in. 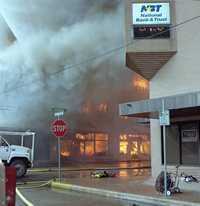 Green-gray smoke billowed from the cinder blocked exterior as citrus colored flames reached toward the late afternoon sky. The fireman arrived just as the courthouse clock struck four, the tower being only a few yards away and level with me, now three stories up. Today, even from here, the chime sounded so distant because of the commotion. Trucks roared. Hydrants opened. A city bucket truck came to a screeching hault. Volunteers poured past. Systematically, almost mechanically, the firemen began clearing the sidewalks, unrolling hoses, and stepping into their uniforms, trying desperately to prepare themselves to fight a fire unlike any the town had ever seen. We could work, but we didn’t. The drive-thru lanes were blocked by engines, which put the tellers in a hellfire panic. This made the bookkeepers nervous, which made the loan officers flustered. I just wanted to get out of there. So I punched out early, deciding to forgo the invitation from Sylvia in New Accounts to join her in the fire resistant safety of the money vault. I shook my head on the way up the lobby stairs. I made my way through Bookkeeping, through the supply closet, and opened the security door onto the roof. The alarm wasn’t even heard. Not today. I made my way around the air conditioner unit and stopped. And from this perchtop post of the State Bank, one of the highest points on the town square, I watched the mayhem and desperation of a town that tried to prevent her landscape from changing. 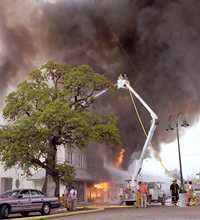 La Grange's famous "Muster Oak" witnessed the blaze; but escaped unscathed. By now, most of the Fayette County courthouse has emerged from the limestone chambers and gathered under the Muster Oak at the corner of Colorado and Washington. The county judge had stepped on the sidewalk with his hands tightly clasped and pressed hard against his chest, leaving the others on the street. I could see him mutter before his mouth dropped. No, Judge, there would be no sanctimonious sending off of a football team to the state championship today, no glorified goodbye to a troop, no political promenade beneath her mighty limbs. We were there to bid another farewell of sorts: an end to Hollywood, whose influence became soot in a small central Texas town that Ash Wednesday. The north wind—unusually strong this March—carried the voices from those gathered below to me, and I could hear their whispers and gasps. And it wasn’t the ablaze Botts Title Company that trumped the conversation, or the equally ablaze China Inn Restaurant, Bertie’s Barbershop, or the income tax lawyer’s office. No, it was the Cozy Theater, slotted between Bertie’s on the left and the JC Penney catalog store on the right. The theater. Our theater.